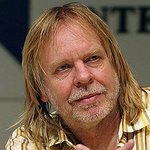 Rick Wakeman is best known for playing keyboards in the progressive rock band Yes. He was president of The Heritage Foundation, which erects blue plaques on the homes and/or work-places of late entertainers and sportspeople. Google trends for "Rick Wakeman"
We don't have any videos related to Rick Wakeman.